Can harm come to me in anyway, if spiritual healing is done incorrectly ? Q: How to select a healer? It is best to select a healer who is not in it for fame or money but has a genuine desire to help people overcome their problems. If one finds a healer that does not meet these criteria, the likelihood of a negative energy healing through him or her is high. Along with the above criteria, it would be better to choose a healer who also has the following attributes. Has a strong underlying focus on spiritual growth. The spiritual healer’s spiritual practice needs to conform to the six basic principles in spiritual practice. However, knowing whether a healer meets these criteria is possible only through activated sixth sense ability. Thus, it is beyond the capacity of an average person. Doing spiritual practice conforming to the six basic principles in spiritual practice ensures development or activation of one’s sixth sense. It is okay to pay for spiritual healing. However, the amount charged by healers should be modest and in keeping with meeting the healer’s basic living needs or to further the spread of spiritual healing remedies in particular spiritual practice. The important point from the healer’s point of view, is that the focus should not be to earn money or fame. Q: Can harm come to me in anyway, if spiritual healing is done incorrectly ? Healers that are after fame and fortune and of lower spiritual level are most likely to be targeted by ghosts. Higher level ghosts use these defects and attachments in the spiritual healer to affect and possess them. The possession is insidious and intangible and the healer would not have the faintest clue that he is being controlled by a ghost. Hence, it goes unnoticed. Once they have possessed the healer, they initially alleviate symptoms of the persons treated by the healer through their spiritual strength to gain their faith but also infuse black energy into the treated persons. If the healer does not have an advanced sixth sense he may not be able to discern the difference between positive and negative in the subtle-world. Hence, while the healer may think he is channelising energy from spirit guides he is actually healing with black energy of ghosts posing as spirit guides. So even though the initial symptoms may be cured to gain the patient’s faith, the long-term effects are quite damaging. Q: What does one do for spiritual healing for loved ones if they are not willing to do spiritual healing remedies themselves? Read the article on the principles in spiritual healing so that we can tell them the science behind the spiritual healing remedy. Explain to them at an intellectual level as to why they should be doing the spiritual remedy. This may help to overcome any unwillingness from their side. Pray that any black covering of the ghost be removed from the loved one’s intellect, so that they listen to the advice. Ghosts often cover the intellect of the person that they possess with black energy, thus clouding their decision making capacity. As a rule of thumb, we suggest that you tell them a maximum of three times on 3 different occasions. After this, it is up to them. Do remember that ultimately it is according to one’s destiny that one has the sense to listen. If one’s destiny is severe, in most cases they will not have the thought to listen, thus making them go through years of pain. All of us are on our own spiritual journey and if we can help others in their spiritual growth, we should. However, if they don’t listen despite repeated requests, then it is best that we maintain a detached philosophical view about the situation (as hard as it may be). This is because not listening is mostly due to our loved one’s destiny to not listen and to experience pain. Q: How do we interpret the effect of a spiritual healing remedy? Unless one has a very highly advanced extra sensory perception (ESP) or sixth sense, it is very difficult to interpret the specific effect of a spiritual healing remedy. This is because without advanced sixth sense, it is difficult to perceive the true reason behind what we experience during spiritual healing. For example, two persons being healed with the help of Holy ash (Vibhūti) may get entirely different experiences. The person affected by a ghost, can experience distress. This is because the ghost in the person experiences the distress as the Divine consciousness (Chaitanya) emanating from the Holy ash begins to fight with the negativity from the ghost. The person without negative energy affecting him, may have a feeling of lightness due to the positive vibrations emanating from the Divine consciousness of the Holy ash. Another aspect is that ghosts of a higher order can withstand the influence of Divine consciousness to a longer extent hence it may appear that the remedy is not acting. They can also show illusory effects to give the person a false sense that things are working or not working. Q: How do I know if the healing has worked? We can assume that a healing remedy has worked when we see a strong co-relation between starting of the spiritual healing treatment and the reduction of symptoms. For example, we have had a person suffering from spasms. When he began to chant, the spasms reduced immediately. When he stopped chanting, the spasms erupted again. This was a problem he had been facing for many years and no amount of medical treatment helped. Here, it went away immediately and there was nothing to suggest any other reason for the subsiding of the spasms. In some cases, the effect of healing may be more subtle and subjective where one sees a qualitative improvement in their lives and a reduction in negative thinking. Most people are interested only in the symptoms being cured. They are not aware of the ghost or ancestor troubling them and who in reality is the root cause of their symptoms. To eradicate the ghost is far more difficult than reducing the symptoms, such as eczema or spasms that it caused. Spiritual practice is the only sustainable way to overcome problems at a root level i.e. the attacking ghost. Q: How long should I do the spiritual healing remedy everyday? Ans. : Depending on the type of spiritual healing remedy used, one has to decide the time to be given to it. The best type of spiritual healing remedy is spiritual practice. Other remedies can be used to augment your spiritual practice to expedite the relief. It is recommended that spiritual healing remedies are done on a daily basis for periods, depending on the severity of symptoms. In mild afflictions, one can do the spiritual healing remedy (i.e. 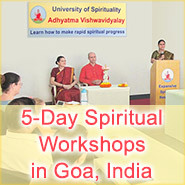 spiritual practice or other types) for 1-2 hours per day in a single session or in a number of sessions. If the severity is high, please do the remedies for as long as possible every day. Refer to “How will I know if I need spiritual healing at all?” for examples of mild, medium and severe symptoms. Q: How long do I continue the spiritual healing remedy? After the symptoms have disappeared, one has to continue the remedy for 2-4 months. Just as in the case of inffective bronchitis, the disappearance of cough does not mean that the illness has been eradicated from the lungs. The germs causing the bronchitis and giving rise to the cough may still persist. Hence, the antibiotic prescribed for eradicating the illness needs to be continued for the prescribed number of days. Similarly, even after the symptoms have disappeared, the influence of the ghost remains hence the remedy needs to be continued for a complete cure. One of the factors affecting the time period wherein the person needs to continue the spiritual healing remedy after cure, is the time taken for the cure to happen. The longer the time taken for cure, the longer one needs to continue it after the cure. Q: How long does it take to be cured? The time to cure a problem due to spiritual reasons can take anywhere from a few seconds to many months or years. For example, one may get relief from the itchiness of a skin rash immediately by the application of Holy water (Tirtha) and gomūtra (cow’s urine) if it is due to a departed ancestor. However, if an addiction for smoking cigarettes is partly due to a person’s liking for it (i.e. in the psychological) and partly due to possession (i.e. spiritual), it could take as long as a year of spiritual practice to overcome the habit. Time taken for cure depends on a number of factors. Amount of personality defects in the person increase the time to cure. This is because ghosts use these defects of anger, fear and emotionalism to build black energy centres in the mind for easy entry. Q: Do belief and faith matter? 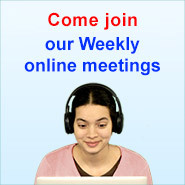 Any questions you may have can be posed on our login facility. An answer will be given within two days.